Swim a few laps or play Marco Polo with the kids, even in the snow! The outdoor pool is heated year round. Loosen up (literally and figuratively) with a stop by the redwood sauna. Your little monkeys will love climbing around on the jungle gym. Recoup and thaw out with a soak at the outdoor hot tubs. Alpine aesthetic and ample seating make the lobby an inviting spot to curl up with that new mystery novel. With the Whistler Village Gondola a 6 minute walk away, you and the crew will be on the slopes in no time. Shopping awaits! 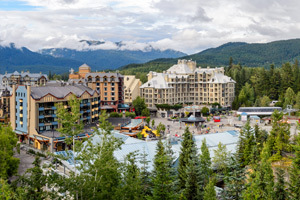 Whistler Village is just a 9 minute walk away. Swim laps all winter long, the on-site pool is heated! Soothe those aching muscles with two outdoor hot tubs. Grab the sunscreen and snacks, Blackcomb Trail is a 6 minute drive. No need to drive (your car at least! ), Whistler Golf Club is an 8 minute walk from the resort. Enjoy all the comforts of home just minutes away from the lifts at Whistler Blackcomb Ski Resort when you book a condo suite at Tantalus Resort Lodge. Roomy units are well appointed and spacious enough for families and friend groups, providing the perfect slopeside crash pad for your crew’s next big ski trip. Fuel for a full day on the mountain with a hearty breakfast cooked up in the en-suite kitchen. Feel free to have seconds - the mountain isn’t going anywhere. Staying so close to the ski resort means no more trying to beat traffic or hiking across icy parking lots. If you’re up for a stroll, the slopes are a short walk away - but if you don’t feel like schlepping your gear just hop the complimentary ski shuttle and you’ll arrive right at the lifts in minutes flat. Get ready for an epic powder day - for years Whistler Blackcomb has been named the #1 destination on the continent by SKI Magazine. With over 8,000 acres of terrain and forty lifts and gondolas across two mountains it won’t take long to see why! A world-class Snow School offers both traditional lessons and special clinics. Adventure Camp provides little ones with fun activities and small class ratios, while the Ride Tribe lets teens try out park, pipe and big mountain riding. At the end of a thoroughly successful snow day rendezvous with the group to decide between eating at one of the countless aprés eateries in the village, or heading back to Tantalus for a home-cooked meal. Finish off the evening with a relaxing soak in one of the outdoor hot tubs, where your crew can swap stories of missed lifts and ski school friends. Each suite at Tantalus Resort is bright and clean, homey and spacious. Fully equipped kitchens (and grocery stores within walking distance) make home-cooking a breeze. Living areas with flat screen TV and cushy couches are prime for spending quality time with the whole crew, with wood-burning fireplaces to up the coziness. One-bedroom units are equipped with a comfy Queen and bonus sleeper sofa, making them a solid choice for couple’s trips and small families. Two-bedroom condos add an extra pair of twins in the second bedroom, making them prime for larger crews. Even furry family members can come along thanks to the lodge’s pet-friendly policy! The beauty of staying in Whistler Village is that there’s literally hundreds of dining options in the area! From bangers ‘n mash and a pint at Dubh Linn’s Irish Pub & Patio, to specialty cocktails and a romantic seafood dinner at Araxi Restaurant & Oyster Bar. Plus, there’s more to this quaint mountain town than choice skiing. Take a break from the slopes with wintery adventures like ice skating, snowshoeing, tubing or even dog-sledding. Not to mention a hundred miles of scenic trails (many of them dog-friendly!) for cross country skiing.